The Main House and The Old Gallery – top group accommodation for anniversaries, weddings..
We’re delighted to now offer a choice of accommodation for the large extended family or a group of friends getting together to celebrate in style! 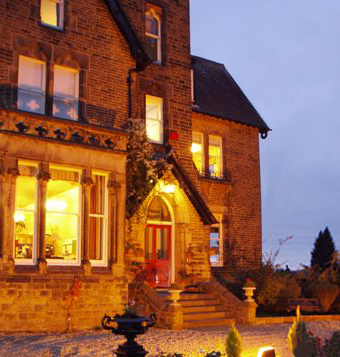 The Main House gives you very spacious accommodation on three floors of the 1875 Grade II Listed country house. It also features the new (1890!) kitchen wing, fitted out with a heritage-style 4-oven Aga, American-style fridge/freezer and a good, old-fashioned spacious larder/pantry. It has its own private bar ready for you to stock! The Main House sleeps up to 20 in seven bedrooms, plus we can offer a sofa bed or two z-beds (best for children) to increase numbers to a maximum of 22. 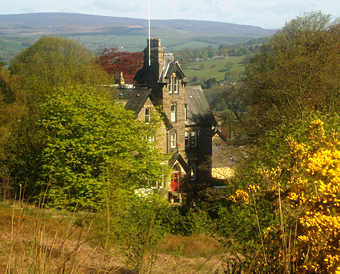 We can also offer a five bedroom option (excludes The Wharfedale Rooms) at a reduced price. 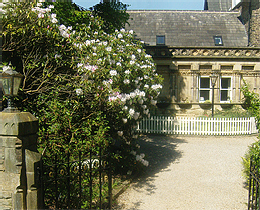 The Old Gallery (which cannot be booked with The Main House) dates from 1890 and is the southern wing to Westwood Lodge. 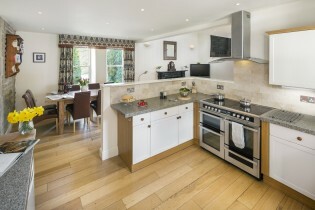 It comes fitted out to Five Star self-catering standards with a range multi-oven stove and open plan living. It is ideal for groups up to 10, sleeping in five bedrooms. Both The Main House and The Old Gallery have their own small private gardens, plus direct access and full use of The Cellars leisure area, the sunny terrace and the animal corner/ play area with Wendy House. Typical groups have included big birthdays (21st up to 90th so far! 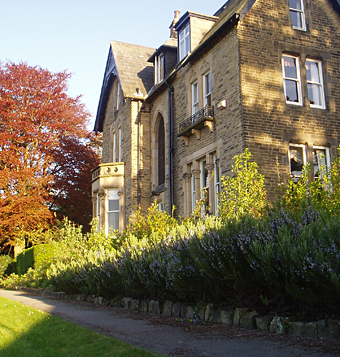 ), attending weddings in Ilkley, Denton, Beamsley and Bolton Abbey, scattering of ashes on Ilkley Moor, Ilkley College reunions and family get togethers from around the world. We specialise in sophisticated hens and can suggest a range of tasteful, fun activities for your weekend including spa pampering sessions and a chef coming to prepare a special gourmet meal for you. Click here for more details. Please read our booking conditions carefully as, if you’re seeking a noisy, wild party venue, we want you to look elsewhere! The Main House (Four Star Gold Award standard) has five large first floor bedrooms, plus a further two bedrooms in The Wharfedale (reached by a secret staircase! ), sleeping 6. The normal maximum sleeping capacity is 20 (or 22 with sofa bed/ z-beds). This is the number that can sleep, sit and dine together in comfort and without distubing other guests. The only way to exceed this number is to book all our cottages and apartments – giving you 25 bedrooms, sleeping 55. 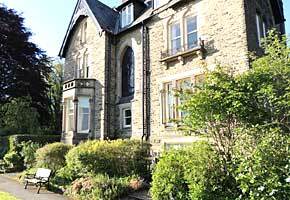 The Old Gallery (Five Star standard) is the wing to Westwood Lodge, but entirely self-contained. It was originally added as a large picture gallery in 1890 to house the Victorian owner’s private art collection. 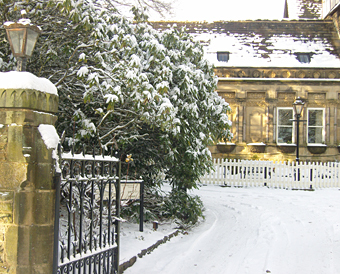 It was sympathetically converted by us in 2003, maintaining all the essential Victorian features and went on to win The Civic Society Award for Best Restoration Project in Ilkley. 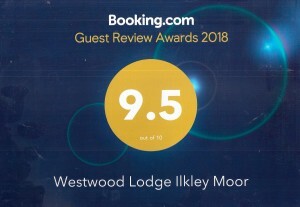 The Old Gallery is very popular for family holidays, wedding groups, college and old friend reunions and those seeking a getaway to the very edge of Ilkley Moor, yet within a short walk of Ilkley town. 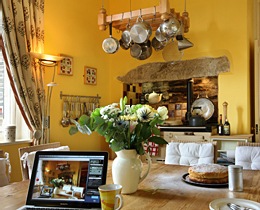 Both The Main House and The Old Gallery are tastfully decorated to a high standard and fully equipped with ceramic hob, Aga or fan oven, microwave, dishwasher, separate freezer, Virgin Media multi-channel cable television, radio and catch-up services, free SuperHub wi-fi and DVD player. The biggest difference is one of space. The Old Gallery has rooms of more modest dimensions whilst those in The Main House are large with tall ceilings and original decorative coving and features, as they were in Victorian times. The Old Gallery has an M2 accessibility rating, whereas all the bedrooms in The Main House are accessed by stairs. Both The Main House welcomes up to three dogs and The Old Gallery up to two dogs. Click here for more information if you’re thinking of bringing your dog. In short, if you’re looking for somewhere special for a civilised celebration, relaxing get-away or maybe a location for a strageic business workshop, there’s everything you should need for your stay.